Helllllooo! 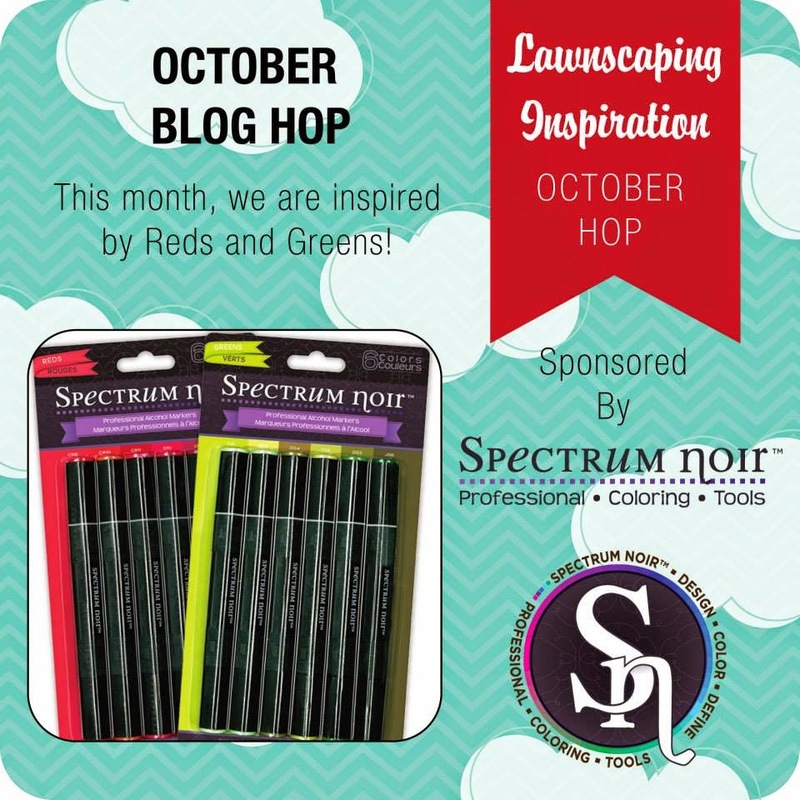 Welcome to another Blog Hop with the Lawnscaping FIT Team!! For this month's hop we are inspired by Reds and Greens!! Before I get into details about my card, I wanted to give a shout out to Spectrum Noir for being our awesome sponsor!! You should have found your way to me by awesome Isha!! I am sure she had something awesome to feast your eyes on! For my card, I wanted to mixed the old with the new! I used Ornate Ornaments for the focal point, and I used Joy to the Woods ( both Lawn Fawn sets, of course) for my sentiment. I die cut a piece of white stampers select card stock and die cut it using the femme frames from Mama Elephant. I stamped out my branches in both Pear Tart and Cottage Ivy Memento Inks. 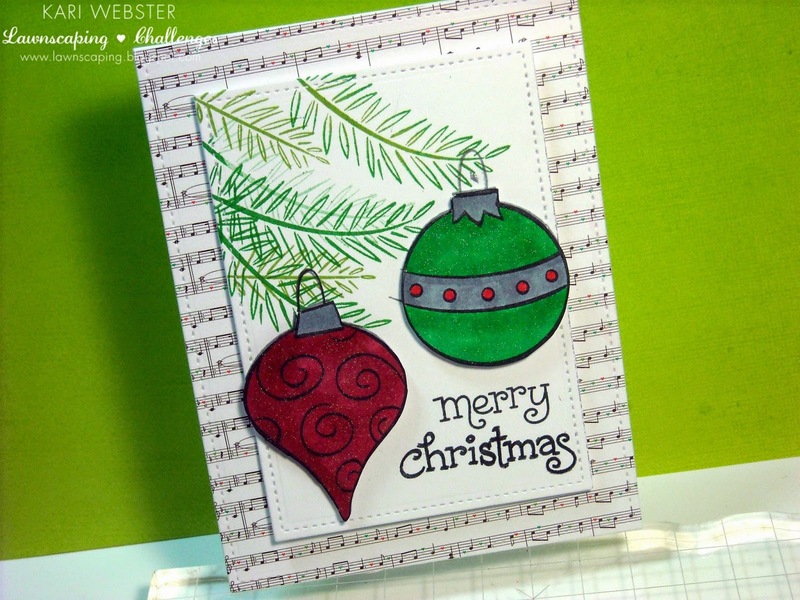 I think stamped the ornaments directly onto my panel in Black Memento Ink, and then stamped them again on another piece of white card stock to color them in with my markers. Once I was done with my coloring, I fussy cut them out using my Fiskars detail scissors and then adhered them on with foam adhesive to give them dimension. I stamped out my 'Merry Christmas' sentiment from Joy to the Woods in Versa Fine Onyx Black, this is my favorite black ink for sentiments. Then, for my card base, I cut another piece of white card stock down to make an A2 top folding card, and I die cut a piece of pattern paper from the Snow Day 6x6 pad using the largest stitched rectangle stackables die. I loved the musical notes paper for contrast with the ornaments. I adhered my pattern paper down to my card base, and popped up my main panel with foam adhesive. For a final touch, I added some shimmer with what else the Wink of Stella Glitter pen in Clear. I hope you like this card, and it gives you some inspiration for your holiday cards this year!! It's time to send you off to the talented Lenny!! Enjoy the rest of the hop!!! Hi my friends! So, we are entering into a new challenge, and right around the corner is Halloween. Now I will be completely honest and say that I am really not into Halloween. Never really was that big into it as a kid either. But, I did have some fun putting together this card for this challenge. I used the cute set Spooktacular. I also used So Thankful for one of the smaller pumpkins. I started out by die cutting a piece of white card stock and a piece of vellum from one of the Large Stitched Rectangle Stackables dies, and then I inked up my background with distress inks - Scattered Straw, Mustard Seed, Ripe Persimmon, and Chipped Sapphire. Once I was satisfied with my background, I started working on my images. 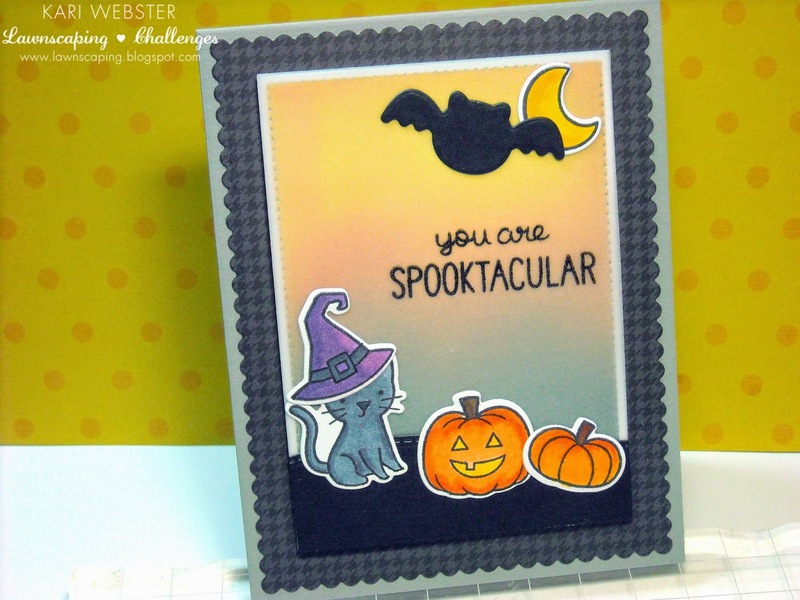 I stamped the kitty cat, pumpkin, the moon and a bat all from the Spooktacular set. I colored all of my images with Copic Markers except for the bat - I just used the die to cut him out of black card stock from my stash. Once I was done with all of my images, I cut out a border for them to sit on out of black card stock. I adhered my vellum onto my inked back ground to "mute" it just a bit, and then started adding all of my images on top. I stamped my sentiment out in Staz On ink as this is a good ink for vellum. You can't tell in the picture, but I added some shimmer using my Wink of Stella clear brush marker on the witches hat, the small pumpkin and the moon. Then, I started to put my card together. I die cut some pattern paper from a Doodlebug 6x6 pad, and added that straight down onto my Smoke Card base, and then I put foam adhesive on my main panel and adhered it to my pattern paper. Turned out cute I think, and I feel I can still give this card to a friend! Hope you like this card and it inspires you to join us for this newest challenge over at Lawnscaping Challenges. Our awesome sponsor is the fabulous Lawn Fawn!!! Link up your project for the chance at a $25 gift certificate! Hi Friends!! Today is an exciting post! I am doing my 1000 YouTube Subscriber Giveaway! I have not officially hit that magical number quite yet - but I am getting really close! I wanted to go ahead and get this giveaway going as I will have two prizes to give away! I have a Rafflecopter for both prizes so be sure to enter for your chance at both prizes! You MUST be a subscriber to my You Tube Channel - that is the ONLY requirement that I have. It is only fair since it is a giveaway for my YT subbies! Like I said, I am doing 2 prizes!! One is a prize pack I've put together, and I have a video giving you a look into more detail on that, and I am also giving a $25 dollar gift certificate to Butterfly Reflections, Inc Online Store to another winner! I want thank you all for supporting me! It means a great deal! If only I could give everyone a prize! Hi everyone! 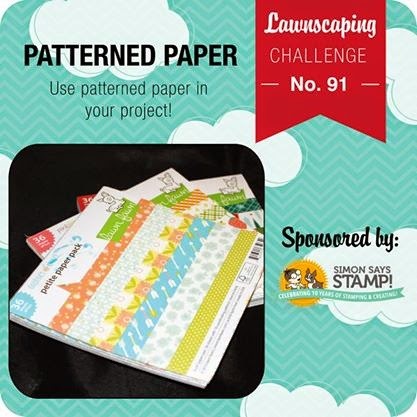 Welcome to the first challenge for October 2014 for Lawnscaping! We are focusing on using pattern papers and there lots of great ones out right now! 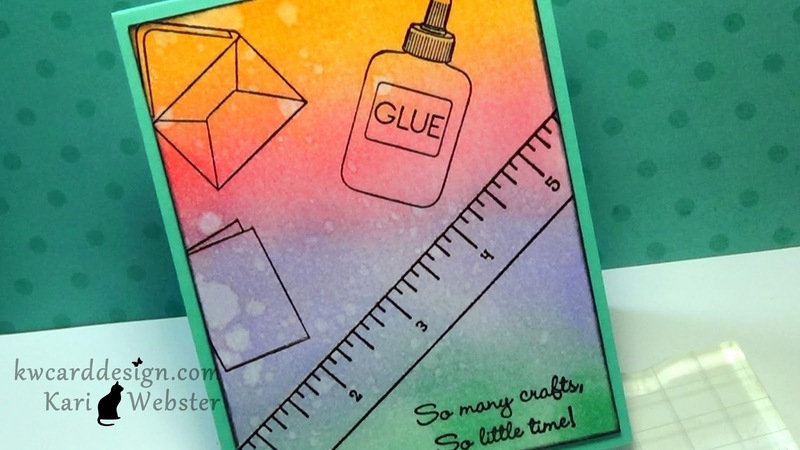 Of course, I used the newest ones from Lawn Fawn and you can pick these papers up along with so many other awesome finds from our sponsor Simon Says Stamp! They are wonderful to give the winner a $25 gift certificate to their store! 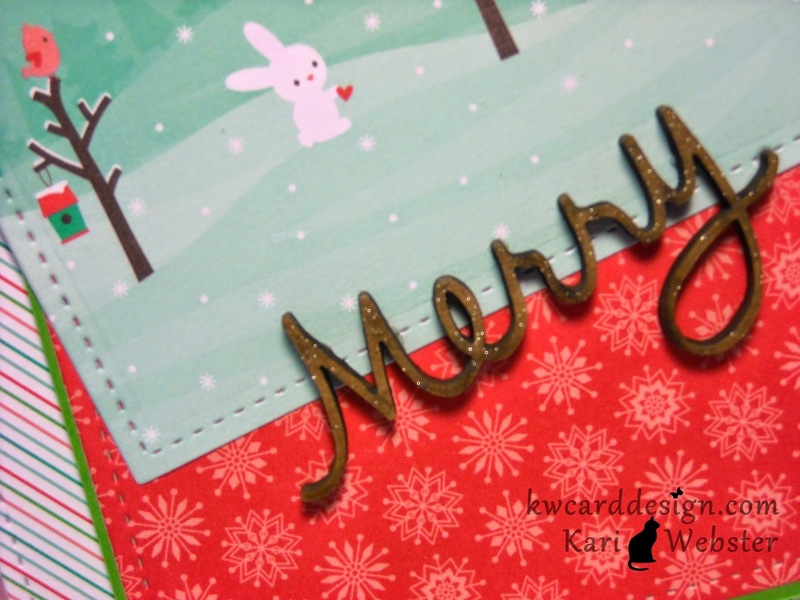 Here is my card that I made and I didn't do any stamping! I used pattern papers from LF's Snow Day 6x6 paper pad. To create the layers, I used the Large Stitched Rectangles Stackables dies - I love these!! I am obsessed frame dies right now! I hope this has inspired you to get out your pattern papers! I know for me - I need to use them more often instead of hanging on to them! We buy these things to use!! I have to keep reminding myself of that sometimes - LOL! Thank you all for stopping by today!! Hope you have a great week!! World Card Making Day + video! Hi everyone!! So - calling all card makers around the world!! Have you had a chance to get crafty today to celebrate this years World Card Making Day? 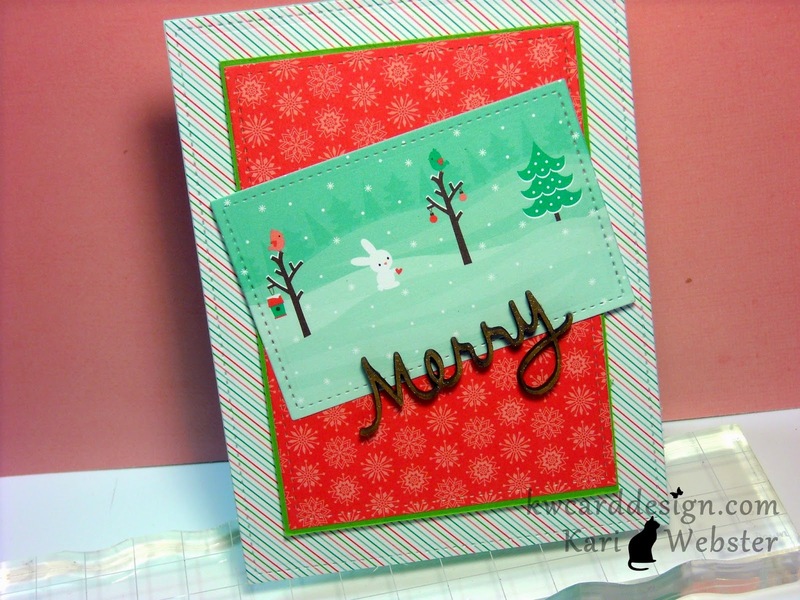 Luckily, I have had a chance to sneak in my card and my video tutorial for you before the day comes to and end! Today, I wanted to make a fun card with lots of color!! I also did one of my favorite techniques as a card maker - Emboss Resist! I used a stamp set that I was not for sure if it was still available, but I did find it somewhere and have linked it below if you are interested in this fun stamp set! All the supplies I used are linked below!! Here is the video to show you just how I made this card!! Enjoy! !